I feel like I don't have to introduce you to Neogen, it's quite a popular brand which you can find at Sephora or Douglas - depends if you're from the US or Europe, I guess it's mostly known for NEOGEN Bio-Peel Gauze Peeling - which I also made a review on before. Neogen Dermalogy line is a line that combines technology and skincare needs. If you wonder if this brand is cruelty-free then the news is that Outin Futures - a mother company of Neogen has the Leaping Bunny Certificate and from what I found the brand is not available in Mainland China. It's all about aesthetic design! The glass container with an applicator has a silver box with blue details but what's inside is just a pure beauty! A glass container with an opalescent coat that makes the product 'instagramable' and the aesthetic. The applicator is easy to use - especially for a "pea" size amount so you don't have to worry that you'll get too much product from the packaging but I'm only worried if I'll be able to get the whole product out of the container when I'm done - we will see that in couple months. I want to note that this product should be used in 12 months since the opening date. The packaging is recyclable - paper box goes to paper while the glass bottle goes to glass and cap to plastic. Quite easy I guess? By the way, the silver coat from the paper box can disappear - I figure that out after seeing one product and my hands in tiny silver flakes. Gel-like, natto-like texture with the scent of wine? The white gel-like serum is quite sticky and sometimes it feels like a slime or natto but once you apply it to your skin - depends what's the base (I mean skincare product you use under the product) the texture can leave the sticky feeling on your skin or not but what's important for us is the smell. I don't know if it's me or the products but ferments always smell to me like wine - it has some sense since fermentation is an important process of winemaking. The scent might not be the most appealing but good news is that - you can't feel it on your face. To understand the product better we need to learn more about fermentation. If you've Slavic or Asian, I guess you know this process well - we make alcohol and lots of dishes based on this process. Fermentation is a method of food preservation with lots of benefits to your guts and health like improves digestion and support gut flora even if some fermented food isn't that lightweight. In skincare, fermentation is a process that should break down the ingredient to make it easier to absorb by the skin. In general, fermented ingredients can have a positive effect on moisture level and they might help with mature skin and fine lines. This product is told to be good for all skin types, my skin is combo so we will see how it goes. According to the brand, this product is made out of fermented ingredients in 61%, that's quite a nice number if we talk about serums. 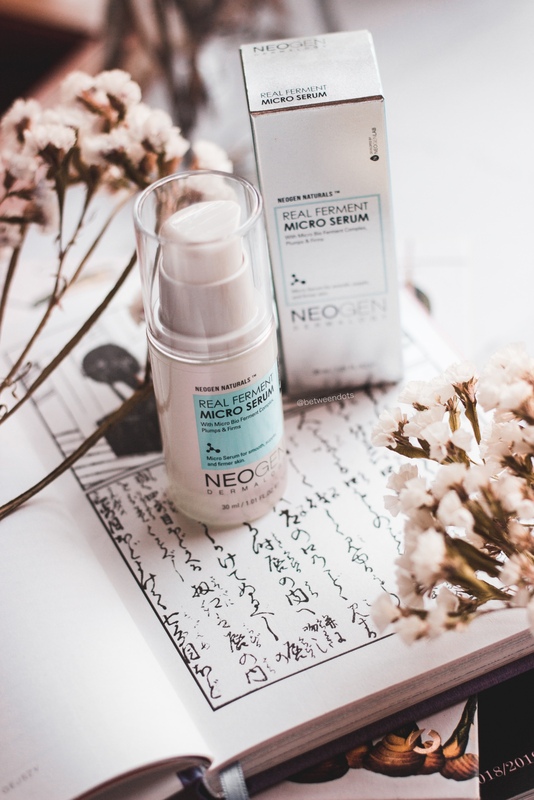 The base of Neogen Real Ferment Micro Serum is Bifida Ferment Lysate, a probiotic that is told to be effective in protecting the skin from UV damage and it can make sensitive skin less sensitive. Another ferment on the list - Saccharomyces Ferment Filtrate is in charge of the moisture. The ingredient that might surprise us is Betula Alba Juice - an antiseptic ingredient, it can be really good for acne-prone and oily skin. I know this ingredient from traditional medicine, it's quite a popular juice which you can get at local shops and it's mostly used when you're sick. I told you before that this product smells like wine to me and I guess here it is - Rice Ferment Filtrate (Sake). In some countries, Sake is called a Japanese wine while in my country people mostly call it a Japanese vodka. One thing that every person can agree is that sake is a Japanese alcohol and it's a result of rice fermentation. But why we add sake to the skincare? It's all about skin brightening. Sake is not the only brightening ferment here - Aspergillus Ferment is told to be effective in this field as well. Ferments are amazing but they are not everything! That's why we can find in this formula ingredients like Niacinamide - a vitamin B3 which is used in products for its anti-aging and skin lightening properties - or Panthenol which is also called Pro-Vitamin B5 - a humectant. I don't know how about you but I'm surprised to see Camellia Sinensis Leaf Extract here - it's an antioxidant, lots of products contain this ingredient because this ingredient can help with damage caused by UV to your skin - it won't be a spectacular effect but it's still here to help your skin. Adenosine and Centella Asiatica Extract are another two ingredients which I wouldn't expect - they can help with wound healing. If you need more moisture then there's Sodium Hyaluronate for you. I guess you might ask what's Ubiquinone? What if I told you it's nothing else than Coenzyme Q10? It's this popular ingredient which you might see sometimes in a commercial for anti-wrinkle products. I don't know how about you but I didn't suspect to see Ascorbic Acid and Thioctic Acid in this formula. Every skin reacts differently to the product so before you try the product check the ingredients if you're allergic to any ingredient or your skin might react badly to the product. This product contains Dimethicone, Sorbitan Isostearate and Tocopherol - ingredients that might be comedogenic. If you've got fungal acne your skin might not like PEG-7 Glyceryl Cocoate, Sorbitan Olivate or Polysorbate 20. There are also silicones like Dimethicone and Cyclopentasiloxane and we've got here Phenoxyethanol as well - not everyone likes it. The good thing is that - there's no fragrance ingredient or artificial colourant and that's surprising! I can't deny - the product has a formula with many ingredients which I like and which can be really helpful for your skin but how does it look in practice? A pea-size amount of this serum is enough for me to cover the entire face. I use this serum daily after the toner but to make the serum easier to absorb by the skin I always try to make my hands warmer first and then tap the serum onto the skin. At first, the serum felt sticky if I used it after the toner but now I don't have this feeling anymore - not sure why this has happened but I'm happy that this problem is solved. The serum is easily absorbed by the skin, I can't tell you if the product really helps with the elasticity of the skin but I'm sure that there are some changes in skin texture - skin feels more smooth now. The hydration isn't on a "miracle level", it makes the skin moist and it gives this trendy "honey skin" look. The serum is well-pressed and it contains lots of active ingredients, I see some changed in the pigmentation and that wound healing time is shorter now but I don't think that this serum is enough to help with all your skin problems. The one thing that I can tell - it helped me with my acne, I had less acne while using it (now I wish I took before and after photos to show). I guess it's time for the most important information - does it work with makeup? Yes, it does! 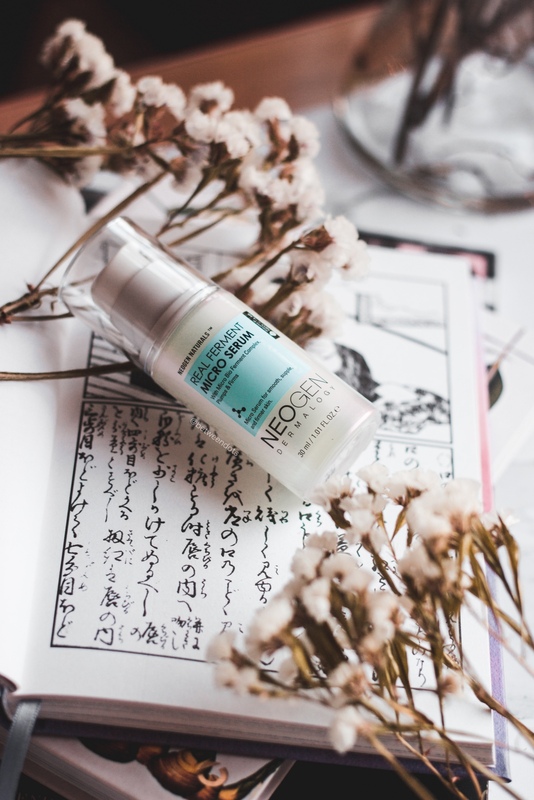 The serum itself is quite nice, I can't say anything bad about it but I guess if you add Neogen Real Ferment Micro Essence which was the first product from Real Ferment series by Neogen you can get even better effects. Where to get Neogen Dermalogy Real Ferment Micro Serum? Real Ferment Micro Serum is a product which is a serum which you can get only from Sokoglam. 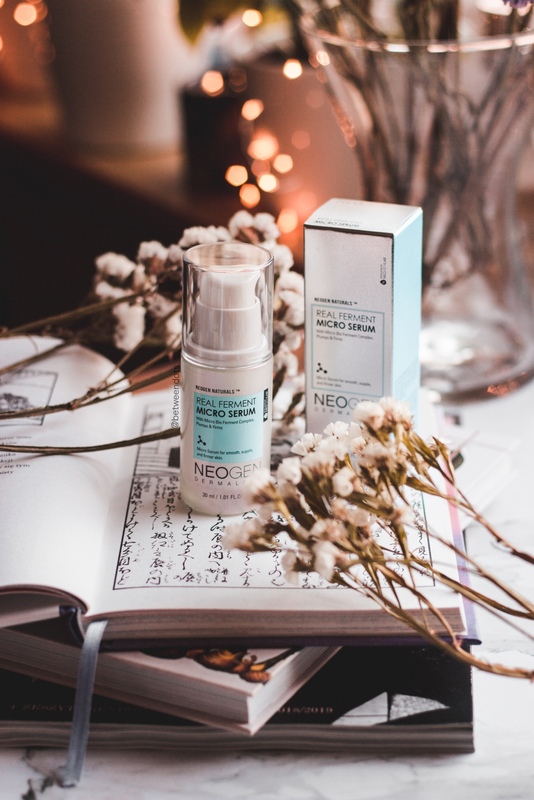 Both Neogen Dermalogy Real Ferment Micro Serum and Neogen Dermalogy Real Ferment Micro Essence cost the same, in the price of 38$ you get 30 ml of the serum or 150ml of the essence. I used the serum for more than a month and I see that it'll last at least 4 months more even if I used it twice a day. Ferments are popular lately but finding products that mix them with lots of active ingredients might be tricky. 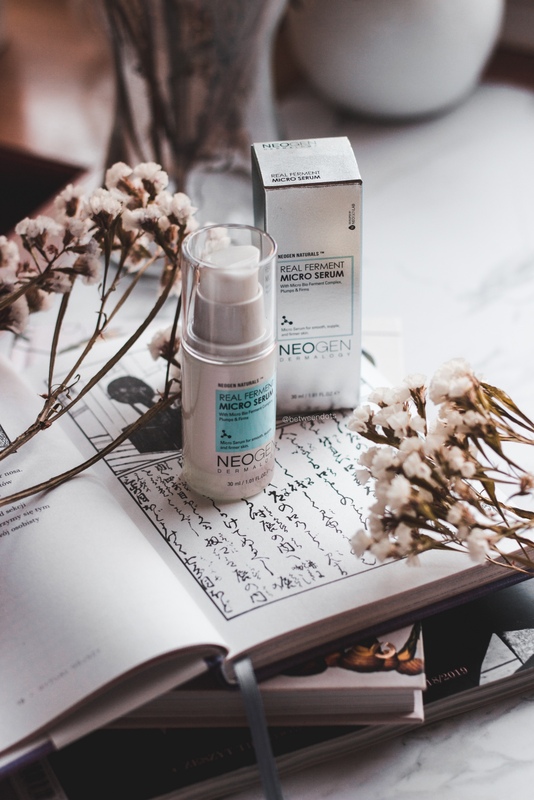 Neogen Real Ferment Micro Serum is not only a pretty packaging but it's a powerful product that can make difference. Have you ever tried this product? Do you like ferments in the skincare? What's your favourite Neogen product?